While watching the Patti Smith documentary "Dream of Life" I began wondering how I'd write about it. Stretches are prosaic, almost like watching a real-time 16mm movie of a working mother who just happens to be a performer, and also stops by to say hi to her mom and dad. Filmmaker Steven Sebring was a still photographer; enthralled with atmospheric effects, he's far more mannered than his subject. He spent ten years filming Patti, her band, kids, parents and friends. Smith's personal style was never "pretty" or conventional. She wears black menswear ("Prada, Prada, Comme des Garçons", she recites, pointing to her pants, jacket, shirt) or jumbled skirts and tees, laced ankleboots with socks. What shines though the meandering decade is her unassailable integrity. The performance sections are thrilling if you're a fan, and way too short. Various celebrities waft though in a communal, supportive role. She reads Allen Ginsberg's poem "On Cremation of Chögyam Trungpa, Vidyadhara" at his funeral, muses over her urn of Robert Mapplethrope's ashes, and shows the tiny tee her son Jesse wore home for the hospital when he was born. Through it all she inhabits her strong, stark style, a 21st century Georgia O'Keeffe. Very little makeup, and deliberately 'undone' hair- bits of braid and tangles- ever more so as the decade of filming passes. There's one split second where the fervid fashionista peeps through. A bandmate dangles a sealed shopping bag before her as they're packing to leave for New Zealand. He's picked up an item for her, but to qualify for the customs refund, won't break the sealed bag open, and reads the stapled warning about a $5,000 fine for doing so. "Oh! I wanna see that Prada raincoat!" she exclaims, and you can hear her excitement and longing. Her comments about making art will encourage artists of any generation. "Life is not some vertical or horizontal line. You have your own internal world and it’s not neat." I've always found her fascinating, and am appreciating her music more and more over the years. Will be on the lookout for that documentary. We got to see an exhibition of her art in Paris last spring -- truly compelling. I'll have to see that documentary -- thanks for alerting me to it. I have to say I have never been a fan of hers but .... Patti has always stuck to her "look" and ideas and for that she is a powerhouse in a world that is so influenced by the "latest" etc. Patti makes Madonna look "sad" with her never ending need to look "young and hip". You are what you are and that takes courage! I love that comment by Patti at the end of your post. I'm not really that familiar with her music, but I do admire her non-conventionality, now that you've pointed it out, her dedication to family and friends. I have never been a fan of her music but admire her strength and personal style. I'll look out for the film too. 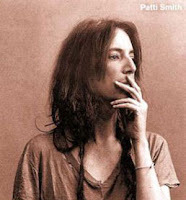 I found Patti Smith compelling at an early age and have long admired her for her art, her integrity, her determination in following her own path. I will have to look out for that documentary. 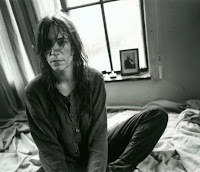 When I was in college a boyfriend once told me I reminded him of Patti Smith. He meant it as a compliment and today I would be flattered, but at the time I was not, and I dumped him soon afterward. In those days I was still yearning for the prettiness I knew I would never have, but which seemed the only way to secure my parents full approval. It took me a few more years to grow into myself and accept that some people can never be pleased.